There is a perception that the Renaissance was something that happened in Florence in the first couple of decades of the 1400s, thanks to the Medici. The Renaissance actually evolved from about 1300 to 1600, a part of what was to become known as humanism that looked back to classical times for its motifs of documentary clarity and beauty. The name was inspired by Petrarch in the first half of the 14th century who used the word ‘rebirth’ to describe what was happening. But, as Alison Cole guides us through the complexities of inter-city politics and manners in the late Middle Ages, we see that while the Renaissance was the inspiration of artists, it was the patronage of the rulers of the city states of un-unified Italy that made it post-classical history’s most important cultural flip. It was a supercharged era of political turmoil and thrust for fast progress, and the magnates of took their principalities through almost permanent war interspersed with filigree diplomacy in which they swapped family members through marriage and court artists like modern footballers. These city potentates were soldiers who made their fortunes as condottieri working for cities higher up the foodchain, popes and Holy Roman Emperors, from whom they won their titles. 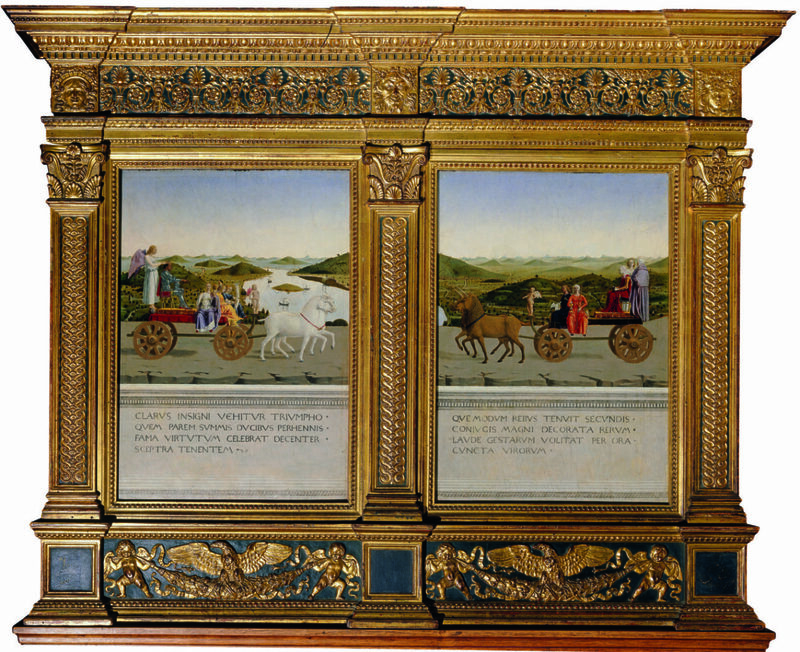 Piero della Francesca, Allegorical Triumphs from the Diptych with Portraits of Federico da Montefeltro and Battista Sforza (reverse), c. 1472. Oil on panel. They believed in the sophistication and refinement of fashion to which they added their own dignity – Pontano’s treatise On Splendour at the end of the 15th century says the French eat for greed, the Italians with splendour, and in an earlier one, The Prince, to a devotion to Aristotle’s Ethics – not being afraid to import it from northern Europe. The virtues, according to various expositions of the time, were fortitude, prudence, temperance, magnanimity and liberalism, an ethic summed up as ‘Maiestate’, majesty. This clarity, order and decorum is seen in the work of the artists they chose, like Andrea Mantegna, Piero della Francesca and Leon Battista Alberti. Most of the artists employed by the magnates were stipendari, journeymen who ranked alongside court barbers, but a few were familiaris, members of the inner circle, and they could have a more precarious existence, vulnerable to whims and to regime change. Some were associated with the particular cities – Pisanello with Naples, Mantegna with Mantua, Cosmè Tura with Ferrara, Alberti with Florence, Filarete with Rome – but, like Giotto early in the period and Leonardo later, they travelled and would be open to offers. 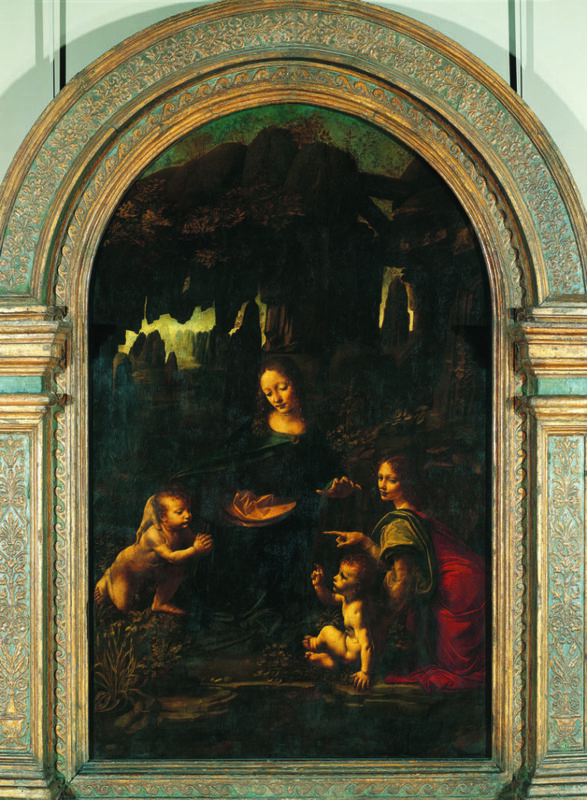 Salaries were not commissions, they were to give the maestri space to work; they could get presents, such as parcels of land, as well (or possibly in lieu, as seems to have happened with Leonardo in Milan). Most artists, though formatively trained as painters or stonemasons, were also expected to be designers and architects, and after the discovery of Vitruvius’s 1st century BC treatise On Architecture in 1414 there was a frenzy of enthusiasm for neo-classical building. Winning a city state through conquest was often the easy part: victors then had to become accepted by the rest of the Italian princes. Alfonso V of Aragon took Naples in 1442 and used art as a diplomatic lingua franca. He brought Jacomart from Valencia as his court painter, attracted Jan van Eyck, Rogier Van der Weyden and the peripatetic Gentile da Fabriano. In 1449 Pisanello was behind the creation of the great monumental signature for him, a triumphal arch. At Urbino there was Federico da Montefeltro who had been a child hostage in Mantua where he was taught at the court of the humanist Gonzagas. He hired Piero de la Francesca who had worked in Ferrara and Rimini (powerbase for Montefeltro’s great rival Sigismondo Malatesta) who painted and created architecture for him, and the Flemish colourist Justus of Ghent. The profile portrait of him and his wife Battista Sforza by Piero was used as a model for medallists and illuminators. The Estes of Ferrara claimed descent from Alexander the Great but were actually of German stock. Pisanello made medals and naturalistic paintings for them, and only the best materials could be used. Tura’s fee for painting the religious figures in Borso d’Este’s chapel was less than the cost of the pigments. The Gonzagas’ Mantua was a buffer between the argumentative Milan and Venice, and they accordingly increased their condottieri fees accordingly to invest in the arts. 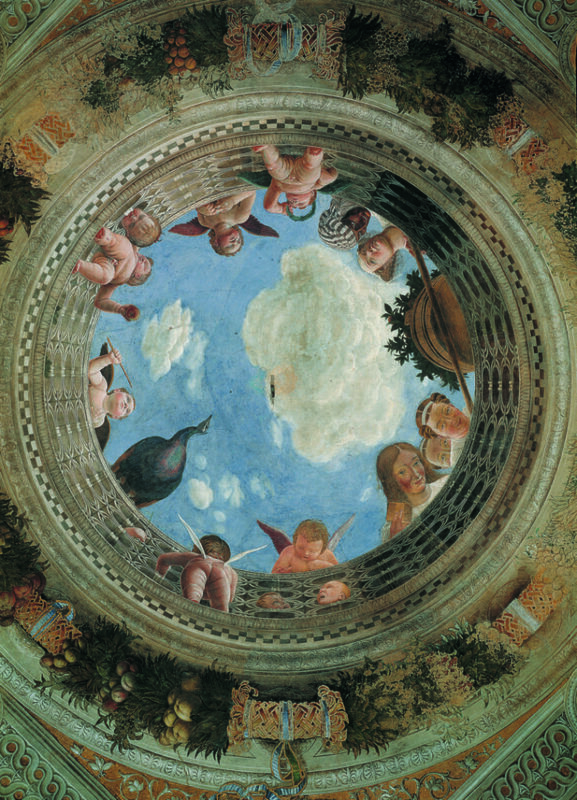 In 1460 Mantegna – knighted by Francesco Gonzaga as ‘our dear familiari’ – was lured to Mantua from Padua and stayed for over 40 years, while the city was rebuilt in classical style. He did a chapel in the church of Sant’ Andrea and bought the land beyond the window so that no other new building could interrupt the light. He created the famous Camera Picta, also called the Camera degli Sposi, the marriage chamber, with its breathtakingly real fresco portraits of the Gonazaga family, where visiting nobles could assess the eligibility of the Gonzaga ladies. Mantegna was also a collector of antiquities, a taste he passed on to Isabella d’Este, Franceso’s wife, who may have created one of the first art galleries in her studiolo where she had up to 1,500 items and where she would hold debates on their qualities – she set Praxiteles’s 4th century BC Sleeping Cupid against Michangelo’s version. Leonardo sold himself to Milan’s Ludovico Sforza as a military engineer, but one of his most breathtaking portraits was of the duke’s mistress Cecilia Gallerani, also called The Lady with an Ermine (1490). In 1498 Leonardo painted his incomparable Last Supper in the refectory of Santa Maria delle Grazie ostensibly for the Dominicans, though their patron was Ludovico who dined there twice a week. But Sforza was running out of money (he was overthrown a year later partly because he had spent so much on art he had nothing left for mercenaries), and Leonardo was given a vineyard instead. It is a potentially confusing story Alison Cole has set herself to tell, and she does it succinctly. None of these princes is the same, there are interruptions to their lines and while fortunes could be made by artists they had to choose their patrons shrewdly, but these patrons enabled some of the most glorious demonstrations of Western creativity. Without going into the detail a volume twice the size could not satisfy, in 240 pages she gives us an image of the cities’ contradictory professional bellicosity against their humanistic sophistication – their ineffable ‘majesty’. Simon Tait is a freelance journalist, writer and editor. He is a former commissioning editor of the Telegraph Sunday Magazine and arts correspondent of The Times and has contributed features to most national newspapers. He is co-editor of the fortnightly Arts Industry magazine. He is the author of a biography of the painter Philip Sutton among other books, and was President of the Critics’ Circle 2013-15.